Selecting the right roof for your commercial facility is one of the biggest decisions you’ll make. A newly-installed roof protects everything under it, keeps heating and cooling energy costs down, and it also keeps your valuable assets safe from the elements. At Hamlin Roofing Company, our goal with our commercial roofing installation services is to understand the performance requirements of the owner, architect, engineer, and general contractor. This enables us to provide the best possible flat or low-slope roof solution for clients throughout the Southeast. At Hamlin Roofing, we specialize in building and installing all of the current commercial roofing systems, including EPDM, TPO, PVC, bitumen, and others. In addition, we install green roofs and rooftop gardens that provide a rich, green alternative to an otherwise flat, nondescript surface. With the latest state-of-the-art technology and the most experienced crews in the area, you will have complete peace of mind knowing your green and sustainable energy options will be installed properly. Boeing 787 Assembly Plant, Charleston, S.C. If your facility needs work from qualified and highly-experienced commercial roofing contractors, contact Hamlin Companies. 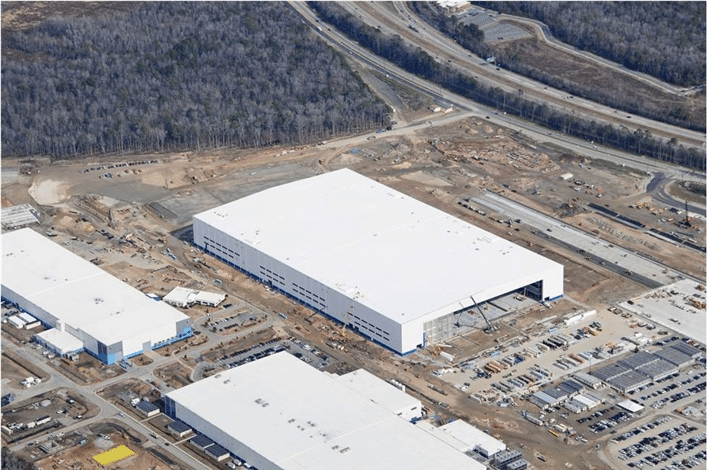 The Hamlin Companies, headquartered in Garner, NC, are proud to serve the commercial roofing installation, maintenance, and repair, and duct manufacturing needs of clients in North Carolina, South Carolina, Virginia, Georgia, Florida, and beyond. Copyright © 2019 Hamlin Companies All Rights Reserved.